The Over 50s’ – On the way up or on the way out? In this two minute HR Blast we take a quick look at employing older workers. Diversity has been much talked about for decades. Often the focus is on what non compliance or downright naivety might cost us in a tribunal. This HR Blast is not about money or employment legislation, instead it’s about thinking about and planning for a situation that is soon going to be relevant to every director and HR manager in the UK: managing, motivating and rewarding the over 50’s. Research courtesy of Scottish Widows and as reported in The Telegraph. As you can see from the chart below, depending on age, between 20% and 40% of workers for some reason still believe that they will retire before the age of 60. Many of these are going to be so demotivated once they encounter reality. It won’t be your job to introduce them to reality but it will be your job to motivate them once they realise they won’t be retiring so young. At the other end of the chart, between 15% and 20% expect to work well past 70. Is your workplace and reward system set up for this? Older workers are realising they will not be able to rely on the state pension to fund their retirement and will need significant additional savings or regular income to maintain a decent standard of living. 17% said maintaining a regular income stream would be key to their retirement plans. 33% said that they plan to reinvent their career when they officially retire by starting a new job, setting up a business or becoming a consultant. 20% plan to continue learning (academic, vocation or language courses). Appraisals: Do appraisal forms and processes accommodate the differing needs of older workers? 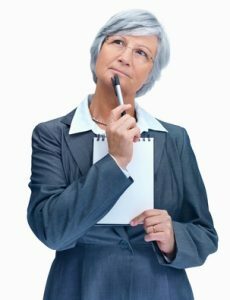 Are you including older workers in your appraisals process? We are seeing more and more employers leaving older workers out of the appraisals round. This therefore means they are not being managed, their performance is not being properly reviewed and they are not being set targets and challenges. But you cannot leave older workers out of appraisals and equally it is not beneficial for either the manager or employee to force an older worker through an appraisal process that they find irrelevant and demotivating. By not doing so however, it means you won’t have the necessary evidence if ever you need to dismiss them at such point as they clearly indicate they will not be retiring any time soon. An idea: Time for two appraisal systems that each reflect the different stages of people’s careers or time for more flexibility within the appraisal process you have? Managing the demotivated: How confident are managers in managing the expectations of staff who wanted to retire but who cannot afford to do so? Its hard to understand someone else’s motivators in life and work when that person is not like you, is not a close friend, has vastly different family circumstances and is entering a stage of life that you have never entered. An idea: Perhaps therefore there is an opportunity to buy in some expertise for your managers so they can learn how to motivate someone who wants to retire, but who just cannot afford to do so. Don’t expect your managers just to know the answers on this one. Supporting the motivated: Given that 20% want to carry on working post retirement, what can HR do to support their staff transitioning into new careers? What great PR and what a great ‘feel good’ factor within the business if you can support your retiring employees into the next phase of their working lives. An idea: Why not run some workshops on topics such as how to set up on your own, how to launch your consultancy business, making money whilst working part time, developing your skills and knowledge post retirement. Not a huge cost at all, but possibly great for morale and great for setting you apart from your competitors. Reward and benefits: Do your reward and benefit schemes appeal to older workers as much as they appeal to your younger workers or are modifications/rethinking required? By 2020 it is anticipated that a third of your workforce will be made up of over 50’s. If you continue to think of older workers as a minority when deciding reward and benefits packages then this will become a problem as they begin to make up more and more of your workforce. An idea: Is there benefit to creating a jobs or reward package specifically designed to attract talent from the pool of older workers? You may well be ahead of your competitors if you seek to attract older workers rather than focus on putting in place management tools to manage the ones who stay. Is a different focus required? And finally, is your company ‘head’ in the right place? Have your directors taken on board the changing age profile of your workforce? Do they accept and understand the demands of a workforce that is dominated by those over 50? Don’t forget to support and train your directors so that they can understand what is required and drive forward the necessary changes in your organisation. If you would like to discuss this topic with our HR team, please feel free to contact us. Or share your thoughts in our LinkedIn group, we’d love to hear from you. In addition to our existing offerings, for those of you who like to budget, Jaluch is now able to offer a package of HR support for a set monthly fee. Please ask us for information.